I just wanted to write a quick note to wish you and your family the very happiest of holidays! I also want to say that I know how much work the holidays can be, especially if the pressure is on to create a magical and memorable experience for your kids and to make sure everyone else in your life is taken care of too. So I know that when I say that you can create the life you want as a parent through photographing your kids, your reaction might be one of confusion. It's the night before the 15th anniversary and still I feel so raw and traumatized and heartbroken. Other sadnesses have passed or at least lightened over the years. This one is deep in my bones. I love myself some good light and some great treats! And Jack here is just so... Jack. For me, every photograph I take is an act of gratitude. Creating, surrounding myself with and and sharing beautiful photos of my kids fills me with joy. Here are my favorite photos from 2014. Columbus Day was my last day off work after I took some time off at the beginning of the school year to handle various school and childcare transitions. We'd all been sick and Keith had been traveling and was gone again so I planned a low key day sticking close to home. After indulging in a little TV (which allowed me to experiment with some different interesting shooting angles) we headed out to our local favorite spot where many photos of the boys (plus some of my clients) have been taken - the Pratt campus. I loved the opportunity to let the kids roam while I captured some "last day of leave" portraits. The time I had with my kids during my leave was so fantastic - a really great opportunity that I feel we all really took advantage of and that I am so grateful for. These photos are a celebration of that and a new phase we are moving into as a family. And then Jack slipped and bit his lip badly and we had to go into they city so he could get stitches! Yes, that really did happen. Unfortunately, or perhaps fortunately, depending on how you look at it, I have prior experience with this due to Liam falling and getting a bad cut on his chin when he was 18 months old. Only then we were at a wedding and left in an ambulance to go to the ER! This was slightly less dramatic. Our pediatrician referred us to a plastic surgeon who was great (no ambulances involved - we got a car service). Apparently this is quite common as they had a whole system down, complete with teddy bear, penguin shaped ice pack and certificate at the end! Jack was a trooper, and Liam was very patient and helpful. Our driver even waited to take us home and didn't charge us extra to do so. All in all, not what I had planned for the day, but everything turned out fine, and thanks to my photos, it doesn't detract from the happy memories from the morning before all the drama. I guess the moral of this story would be - capture the moment because you never know what is going to happen next. Also, I ended up skipping a week in my DSLR sibling photos prior to this but I think enough happened on this day for it to count for two weeks! It's ok not to be perfect. I'm giving myself a pass on this one! It turned out that for various reasons, I didn't get a lot of opportunity to photograph Liam and Jack together much in week 2. I snapped this and a few other photos while they were sitting watching TV at grandma's, but it wasn't until I applied my super secret creative technique to this photo it turned into something I loved. Cropping is an easy way to make your photos more creative after the fact. If you captured a sweet, emotionally good moment but the photo is a little blah, chances are that the composition is not strong. This may especially be true if your camera limits where in the frame you can focus. Or in this case, I didn't want to get too close to the boys to disturb them so cropping after the fact allowed me to get in closer and achieve more of an off center composition that strengthened the photo and made it more striking. I also like the natural eye contact from Jack, whereas Liam is completely focused on his TV show. We try not to allow too much screen time but when we do, this is pretty typical! In fact, it's Jack's eye contact and look of puzzlement that makes this photo a winner for me. I'm loving all the sibling photos in the Photosanity Peer-to-Peer Facebook group! Several parents are joining me in this focus for a "52 project." To join in, join the group - membership is free with a purchase, past or current, of any one of the Photosanity workshops. I love the way Jack smiles with his entire face. His face can light up in a second and at that moment he looks like the happiest kid in the entire world. Of course, as a mom, it is very special when I'm the one he is smiling at, and I have many precious photos of exactly that, but a few weeks when we went backyard camping up in Connecticut, his eight-year-old cousin was the one making him light up. He was laughing and giggling with her and this photo is probably one of twenty I could have shared. I also captured one moment when he looked over at me, still smiling broadly. You would think THAT would have been the photo I most wanted to share... and it almost was. Natural eye contact and smiles are gold, right? Except that this photo drew me more. This photo is more true to the moment and what I most want to remember - him smiling at her. That we are surrounded by extended family, that my boys are growing up with their cousins, that they have such a great time hanging out with them - that is what that moment was about. That is what this photo represents, even if that meaning is not explicit in the photo itself. What I see in this photo is love - for someone else. And I couldn't be more thrilled! I know some kids around the country have been back to school for weeks now, but here in NYC yesterday was the first day of school for many, and my facebook feed has been hot and heavy with first day of school photos. Jack's first day of preschool was on Friday, and Liam's first day at his new school for pre-K was yesterday. Both my kids were utterly uninterested in carrying their backpacks and they are so completely unused to posed photos that I satisfied myself with more informal portraits on the front steps before setting off for school. Jack is doing well settling into preschool (he is only going twice a week) and will have his first full day at the end of the week. Liam, by the sounds of it, had a great first day. At his old preschool, he was used to getting dropped off at the classroom door so when he saw that I was hanging around in the classroom today, he politely asked "are you going to leave the classroom?" in a tone that meant "uh, you can leave now, thanks!" And I actually managed to get quite a bit of detail from him about his day yesterday evening! As I suggest in my Mom355 blog post on back-to-school photos, I've been taking a lot of photos over the past week and will continue to do so over the next few days. I'm also starting to plan for next year's school photo book! What new photo projects do you have planned for the school year? The day before Liam's first day at preschool in March 2011. And just like that, seemingly in the blink of an eye, two and a half wonderful years at Liam's preschool are over. I can't believe it. I remember his first day there like it was yesterday - literally yesterday! I remember, the anxiety (mostly mine) and anticipation as we headed into the unknown. And I remember the surprising heartbreak at leaving him somewhere unfamiliar and how different and how much harder it was at first than the separation of leaving him with a babysitter in our house. The day before the first day of school year, September 2012. Over the years, Liam, who started as a quiet two year old, has blossomed into a confident, talkative, social and outgoing four and a half year old, in large part due to his time there. One of the things I have loved the most is seeing the friendships his preschool experience has fostered thrive and his friends' families have become our friends too. Liam has learned not just about dinosaurs and birds and volcanoes and worms and the life cycle and the solar system and "jobs and careers" (yes, they really did a module on jobs and careers!) but he has developed curiosity and a love of knowledge, and he has learned how to be part of a community. Liam during the last week of preschool, August 2013. As his preschool class disperses (as is the nature of Brooklyn, everyone is going to different schools) I feel bereft... yet also excited about the next stage and the new community we are joining as he starts a new, bigger school next week and goes into pre-K. We went to orientation last week and met his new teachers and some of the other parents and I am excited about what the future will bring. 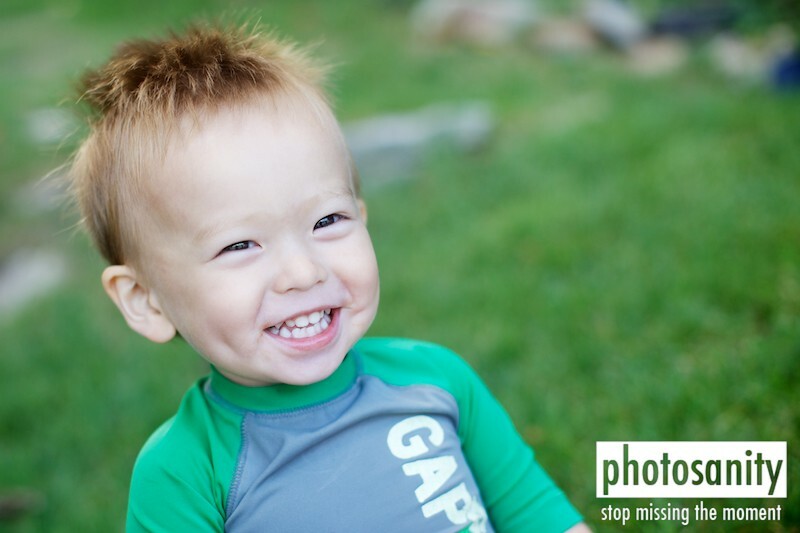 Plus Jack will start at his old preschool at the end of this week! So we will not be going completely into preschool withdrawal... but will miss all our departing preschool friends. What transitions are you going through right now and how can photos of your kids help you reflect as well as, mark this time and look forward? Back to school is one of the best times of the year for taking and sharing photos. It’s also the perfect time to perfect your skills so you can capture these special moments. There really is nothing like a back to school photo to capture the changes, excitement, and enthusiasm of a new year. For me, this year is back to school for both Liam and Jack and it marks big changes for all of us. I’m getting teary already. Liam only has a few more days at the preschool he has been at for almost three years. Then he’ll be starting pre-K at a new school, and Jack will be starting school for the first time at Liam’s preschool. In honor of back to school last year, I shared some of my thoughts about the day and capturing the moment and I want to share it with you again now, as a reminder for parents bringing their kids back to school and for all the first timers and new Photosanity parents that are feeling that unique brand of excitement and anxiety that comes with the first day of school. I look at these photos above, taken just as we were leaving the house for his first day of school and wow, my heart is beating a little faster just remembering how brave he was and, truthfully, how brave I had to be. 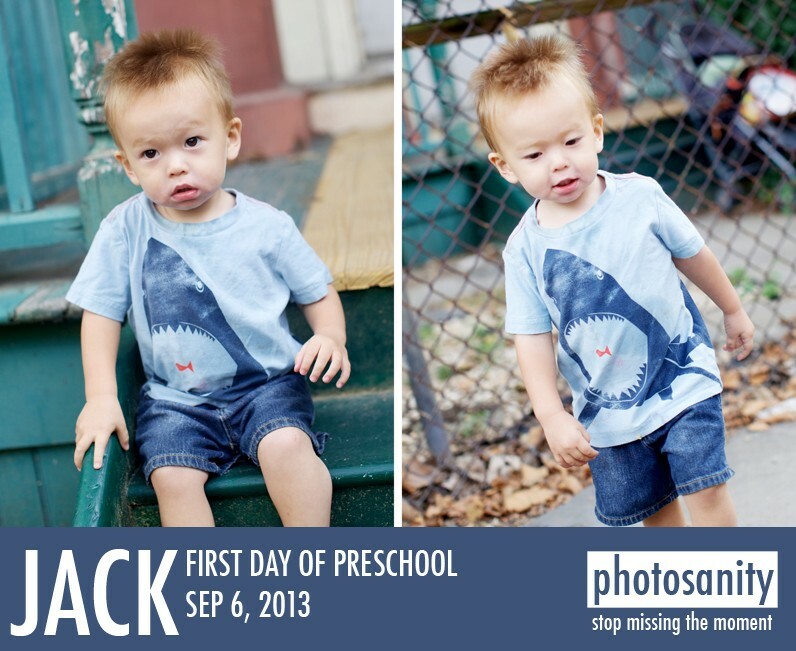 Read on for my back to school photo tips to capture your first day of school moments. The start of the school year is the perfect time to begin a photo-a-day project. Changes in schedules often mean new opportunities for capturing the moment and treasuring the time you do have with your kids. Don’t think your work schedule allows for it? Here’s how I do it and how it could work for you, too! The photo-a-day project is a great way to keep the positive energy that you have at the beginning of the school year going all the way through to the end. It will also show you just how much your child is changing, growing and learning every day. For big moments like back to school, we parents can get a little ahead of ourselves and become anxious about capturing the right moment the right way. Follow these tips to overcome those feelings, and when you find yourself yelling “SMILE!” from behind the camera. Get started with just an hour of your time and the gear you currently have. Sign up for your free lesson now, then share those amazing back to school photos! New York City is filled with spectacular photo locations but a great photo session with your kids doesn't require anything fancy. A simple local playground can be chock full of great photo opportunities, especially if it's early on a cloudy morning where you don't have to worry about harsh shadows and before the playground gets more crowded. A couple of months ago, Keith took Liam fishing one Saturday so I took Jack to the playground by himself. He had a great time... and so did I. 1) Shoot at your child's level, or even from slightly below. 2) Wait for natural eye contact. Your child will periodically make eye contact even from across the playground. 3) Capture your child in action! It may take several shots but keep persisting. 4) Keep an eye on background clutter. Try to avoid getting cars, strollers, trash cans or other people in the background if you can, or use a shallow depth of field so they are blurry enough to not be distracting. 5) Look for off center compositions that will make your photo more interesting. 6) Look for interesting views. Take photos through parts of the playground structure and use its different levels to your advantage. 7) Look for soft diffuse light rather than bright direct sunlight. This is why cloudy days are so great for photos. 8) Capture your child's emotions, such as the moment of hesitation and anticipation before going down the slide. 9) Use your camera to bring you more into the moment. This allows you to enjoy your time with your child, cement your memories of this time, and create images that you can share with them years later. 10) If the playground is within walking distance, photograph the walk there and back as well. It's all about the journey and not just the destination. On the way home, Jack suddenly stopped and started clapping and singing and laughing. This photo is one of my favorite recent photos of him, even though the background is just sidewalk! A recent photo challenge theme in the Photosanity Peer-to-Peer Facebook group was "summer" which is of course was a very broad and open theme, but seeing those and other recent photos from the group has had me thinking about what a great time summer is for experiences, photos and memories. Many of my favorite summer photos and memories since I met my husband have been from the times we've spent at his Uncle and Aunt's house by a lake in Connecticut. Only a 90 minute drive away, we've spent many summer days up there (as well as other days year round). The kids in the family, all Liam and Jack's cousins, love it, and it has been so great to see our kids get to have that same experience. Keith recently took Liam on his first fishing trip up to the lake, and Liam was so excited! They caught 17 fish (all catch and release) and the trip was a huge success. We were up there for July 4th also and Liam spent about five hours in the lake swimming around in his life preserver and had to be dragged out for dinner - he had a blast! This past weekend we were there again, and Liam "swam" across the lake and back... twice! (Swam, meaning, with a life preserver, and piggy backing on Keith some of the way.) And Jack had a blast throwing a ball for his new best friend Dukes, the Boston Terrier. Here then are some of my favorite photos from the lake over recent years. If you have a place that you return to over and over throughout the years, pulling together a series of photos across time from the same location can be a great way to reflect and reminisce as well as celebrate the good times. As a young girl growing up in England, I remember getting so excited about the Royal Wedding and the subsequent birth of Prince William and Prince Harry. So I have to admit that while I haven't followed the Royal Pregnancy too closely, I was pretty excited to hear about the much anticipated birth of the Royal Baby yesterday. Yes, the Royal Family is privileged beyond what most of us will ever experience, but quite frankly that is not a job I envy at all, baby or no baby. And as my very wise friend at Ask Moxie pointed out, maybe Kate knew what she was getting into with her marriage, but no parent ever knows what they are getting into when they first become a parent. As a new mom, one of the things that helped me the most was hanging out with other new moms, sharing experiences, resources and support. I'm assuming that's not much of an option for William and Kate... although hopefully they have a good social support network of friends too. As I said, I don't really follow the Royals beyond the can't-miss headlines that make it over here, but William and Kate seem like a nice couple, and as I said, I don't envy the pressure and responsibilities they have. Parenting has brought me so much joy - even amongst the hard work and every day challenges it's been the most rewarding thing I have done and I hope the new Royal parents get some space to experience some the same thing. And yes, as with any new baby, I can't wait to see the photos! I have to admit, I don't always keep up with my ShutterCal photo-a-day projects (one for Liam and one for Jack). I have all the photos and eventually plan on back filling, but I totally get it - it's not always easy to keep up on a daily, or even weekly or monthly basis. But it's so much easier and more satisfying. The months without gaps look so great! And I'm pleased to say that I'm 100% complete for the last three months. I'm particularly proud of this month's calendars as this was my first month as a full time working mom. Yes that's right, I am back in architecture! A great opportunity came up so I decided to give it a go, while still continuing to grow Photosanity and of course bring up two kids. Yes, I know, kind of insane, and as you can imagine it was a tough decision to make, giving up so much time with Liam and Jack. A little heartbreaking, actually. I've loved having the chance to be home with them for much of the time and I've had some of the best years of my life doing so. Overall though it's a positive move for me, my family and for Photosanity - you will not see any major changes except for continued growth and development. Further, I am now putting to the test for myself in a much bigger way the concept of making the most out of your time with your kids and staying connected to them through photography. I'll be sharing my experiences and what I learn here, on the blog, with my coaching clients and in future workshops. Case in point is my photo-a-day project. I'm lucky in that not only are my parents here to help with the kids but my father, who as some of you may remember is a serious amateur photographer himself, has taken over capturing the daily moments with the kids when I am not there. It took some trial and error and adjusting but we now have a system set up involving daily uploads to Dropbox so I can see what the kids got up to while I was at work and keep up with my photo-a-day project using a combination of his and my photos. For those of you that have help with your kids, your child's caregiver may not be a photographer like my dad, but they can still take and share photos with you. I know many caregivers love to take photos of the kids they look after so you might be surprised if you ask. Or they might already be texting or e-mailing you photo updates and it's simply a matter of incorporating some of those photos into your own collection. And it doesn't have to stop there. Many day cares, preschools and schools take photos on a regular basis that they share with you (we get weekly photos from Liam's preschool) so you can use those photos, as well as any that other friends and family members take - there's nothing that says that you have to be the sole documentarian for your family! For those of you working outside the home in particular, I'd love to hear from you. What are your challenges? What have you found helps you stay connected to your kids? Leave a comment below! There was one magical day back in May 2010, a beautiful spring day, which is rare in NYC when it feels like we go from winter to summer with the flick of a switch. Liam was around 15 months old and it was one of the first times that we went for a walk in the neighborhood without taking the stroller. Some of the details are blurry now - was he transitioning from two naps to one? Did I wear the baby carrier just in case he got tired? I think the answer to both those questions is yes, but I don't remember for sure. But there are moments from that walk that I remember with crystal clear clarity, not so much because I have photos to remind me, but because the experience of taking those photos helped me to more fully experience those moments and cement them in my memory. I remember his sense of discovery that I experienced through his eyes as he stopped and examined a rock here, a step there, banging on a gate, picking up a stick, looking at a fence. Everything was fresh, new and curious to him, and he was relaxed and at ease with no view to rushing to a destination. It was all about the journey. And he carried this same sense of exploration with him to our destination, the Pratt campus. This photo captured that moment that every mom experiences and, if she takes the time to notice, treasures, when her child shares their discovery, their amazing rock or stick or leaf, by holding it up to show them, looking up earnestly and expectantly for what they have come to expect - a reassuring, encouraging and validating response. This photo captures a moment no other photographer could have captured, because this photo shows Liam looking up at ME, his mother. He is looking right into the camera but really he is looking at me. That's what I love about this photo - it captures, emotionally, the experience of being a mother, and of having your child look up at you like that. If someone else had taken it, it wouldn't have the same meaning to me. It's one of my favorite photos of Liam. The 15 month old is gone now, replaced by an unfathomably large and articulate four year old, but the moment, the memory, the feeling will always be with me. He's also wearing one of my favorite outfits of his from that time - I love these simple overalls! And I was really excited when I got them out of storage the other day and Jack wore them for the first time. We didn't do the same walk, and I didn't exactly set out to recreate the same photo, but we headed to the Brooklyn Botanic Gardens with the intention of taking photos and... the moment presented itself and I, remembering the first photo (it hangs on a wall near my desk) grabbed it. Seeing these two photos side by side kind of blows my mind. I can't stop looking at them. My two boys, looking up at me together from across time. Jack is actually three months older than Liam was in these photos. And while it's hard not to compare siblings, I feel like these photos celebrate both their similarities - their connection as brothers - as well as the ways they are different. I love photographing my kids. I love the experience it gives me. I love the memories it creates and the opportunity it gives me to reflect.